I started this novel right before I left for my trip to eastern Europe this summer. I wanted to start it to make sure it was something I would find interesting. There's nothing worse than a long flight and a boring book (perhaps a screaming child on said flight, but I was lucky). Shortly after starting it, I had to put it down. I would have read through the whole thing before I left the States if I hadn't rationed myself. 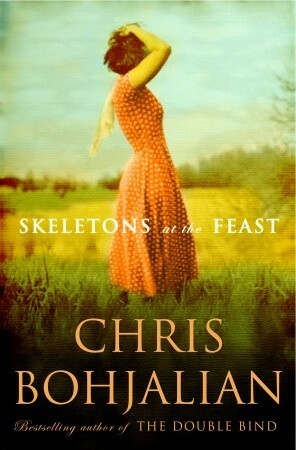 I enjoy historical fiction set during World War II and Skeletons at the Feast didn't disappoint. It gave a different perspective on WWII. Usually, the stories I read are told from the perspective of the allied forces or a Jew. Bohjalian based his story on a journal written by a family friend who happened to be a German plantation owner. Her family had lived on this farm for 100s of years. She loved Germany. She had a picture of Hitler in her parlor. I have always wondered how anyone was fooled in to siding with Hitler. Between the personal stories I saw while visiting the Holocaust Museum in Budapest and following the journey of this woman and her daughter through the last year of the war, I gained an understanding. It was also scary to see how easily one can be misled and I wonder had I been in their place would I have seen the evil. Skeletons at the Feast is not for the faint of heart. I had to set it aside a few times to calm down. Bohjalian doesn't pull any punches with the violence and atrocities he describes. However, at the same time, the reader rejoices over the human strength these characters possess to endure such travesty. Thankfully, the author does not leave the reader wondering what the future held for these characters. We are given a glimpse of how they fared after the war ended. I think Skeletons at the Feast is a wonderful tale that any historical fiction fan will enjoy. Buy Skeletons at the Feast at Amazon.com. If you list historical fiction I have a book for you! Skeletons at the Feast sound great. Another one to add to my list. Thanks!